Don't be fooled by this trailer’s boxy façade—inside lies an impressively spacious and luxurious miniature home! 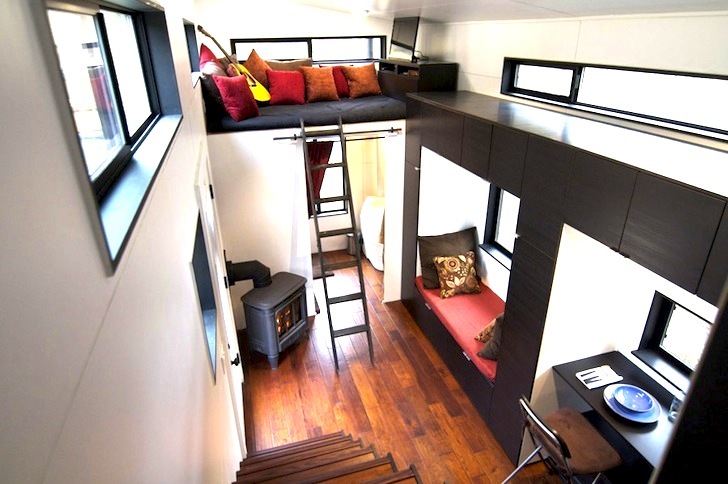 Designed and built by Andrew and Gabriella Morrison, hOMe is a 221-square foot tiny house mounted on a flat-deck trailer in Ashland, Oregon. Created to function off grid, hOMe was built and furnished for $33,000 in just four months. By building their tiny home on wheels, the Morrisons were able to bypass many of the building codes and regulations that normally stand in the way of building tiny homes. Although hOMe measures just 8.5 feet wide, its tall slanted ceilings and white walls gives the narrow house the illusion of space. The couple also placed their fully equipped kitchen and bathroom at opposite ends of the house to maximize the full width of the galley style trailer. Strategic glazing also adds to a sense of spaciousness by bringing natural light into the tiny house and offering views out to the couple’s forested five-acre property. Beautiful black cabinets double as storage space as well as physical dividers that frame the different “rooms” of the house. Storage space is also built into a black staircase that climbs up to the large loft master bedroom. The second loft bedroom can be accessed via a ladder on the opposite end of the home. A small fireplace is tucked into the corner next to the ladder. How did you make your walls? What did you use to make them?Did you use a roll-cage? I am sooo getting me 1 of THESE! 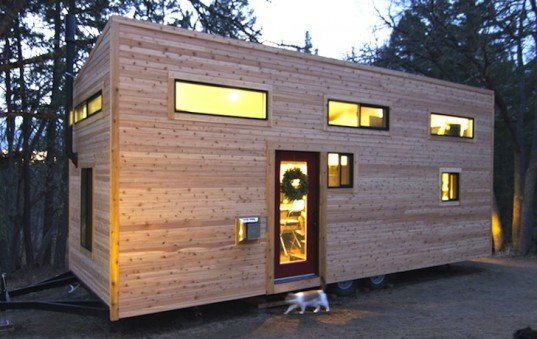 By building their tiny home on wheels, the Morrisons were able to bypass many of the building codes and regulations that normally stand in the way of building tiny homes. The couple also placed their fully equipped kitchen and bathroom at opposite ends of the house to maximize the full width of the galley style trailer. Beautiful black cabinets double as storage space as well as physical dividers that frame the different "rooms" of the house. The large kitchen has an abundance of cabinet space. The spacious kitchen is equipped with a full size gas stove and oven. Nearly 12 feet of counter space wrap around the kitchen. Since hOMe is off grid, the bathroom includes a large Sun-Mar composting toilet. Storage space is also built into a black staircase that climbs up to the large loft master bedroom. The second loft bedroom can be accessed via a ladder on the opposite end of the home.